Introduction: The understanding of cancer has evolved into a complex disease, which has heterogeneous characteristics between different patients, and more than that, a broad range of genetically distinct cells in the same tumor. Chronic and non-transmissible diseases such as cancer have become even more important worldwide and advances in their characterization and properties are running out. In a suitable setting, early diagnosis of cancer and proper treatment are essential to overcome the barriers of tumor healing and quality assurance of the patient's life. The studies included in the analysis were independently retrieved by the authors. The text words included “Non-Small Cell Lung Cancer,” “NSCLC,” “biomarkers in NSCLC” and “gene in NSCLC”.” We were used to perform a systematic literature search in the PubMed and Web of Science databases. There was limit on the start date for published articles (2001), and the search ended in December 2017. For a more comprehensive analysis, articles were only in English. Non-small Cell Lung Cancer (NSCLC) Microenvironment: This review focuses on lung cancer, especially NSCLC, one of the most worldwide common cancer types, showing the importance of tumor microenvironment in this disease. 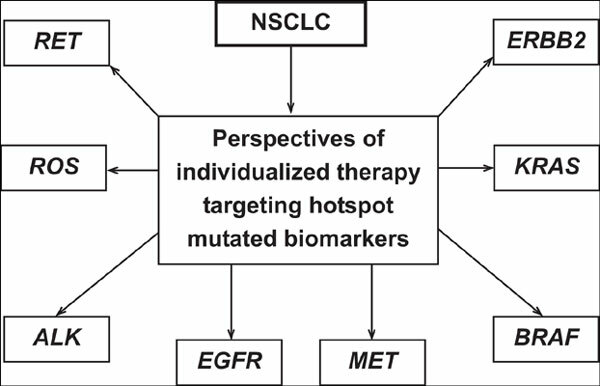 NSCLC Biomarkers: This review shows a molecular aspect of NSCLC biomarkers used in clinical approaches, such as EGFR, KRAS, MET, indicating mutations that are crucial for cancer progression and related to treatment properties. We also describe 11 drugs commonly used in cancer treatment that are correlated with the patient genetic profile. Conclusion: This review highlights the importance of molecular diagnosis of mutations in lung cancer, driving to individualized therapy with the intent of getting a better response to treatment and improving patients’ quality of life. Keywords: NSCLC, biomarkers, alternative biomarkers, targeted therapy, lung cancer, EGFR, KRAS, MET. Keywords:NSCLC, biomarkers, alternative biomarkers, targeted therapy, lung cancer, EGFR, KRAS, MET. Abstract:Introduction: The understanding of cancer has evolved into a complex disease, which has heterogeneous characteristics between different patients, and more than that, a broad range of genetically distinct cells in the same tumor. Chronic and non-transmissible diseases such as cancer have become even more important worldwide and advances in their characterization and properties are running out. In a suitable setting, early diagnosis of cancer and proper treatment are essential to overcome the barriers of tumor healing and quality assurance of the patient's life. The studies included in the analysis were independently retrieved by the authors. The text words included “Non-Small Cell Lung Cancer,” “NSCLC,” “biomarkers in NSCLC” and “gene in NSCLC”.” We were used to perform a systematic literature search in the PubMed and Web of Science databases. There was limit on the start date for published articles (2001), and the search ended in December 2017. For a more comprehensive analysis, articles were only in English.